Cambodia is one of South East Asia’s gems, boasting stunning natural beauty, enviable history, and rich culture. When planning a trip, weather considerations are crucial. Cambodia’s northeast monsoon season runs from December through April, bringing sunny, dry weather, especially in January and February. The rains come when the winds shift into the southwest monsoon from May to November, along with it the possibility of four seasons in a day, the highest period of rainfall occurs in September and October. Typically, peak tourist activity is in the months of December and January, where the skies are clear. However, there is a sweet spot that exists in the months of April to October, during Cambodia’s ‘green’ season; a time when crowds are sparse, and the countryside is verdant. During the green season, most establishments and tourist activity spots suffer a dry spell, resulting in additional value all in an attempt to entice potential customers. During this season, you are bound to enjoy especially competitive rates and special offers. The savings span across your entire experience, with transportation and general market pricing being more flexible and open to negotiation. At Song Saa Private Island, we offer a green season promotion every year, offering great savings with zero compromises. Keep an eye out as it is coming soon! During this season, there are plenty of opportunities to experience the best the country has to offer. If you have been to Angkor Wat, you would have realised that capturing the beautiful temple in all its glory is extremely difficult, with the place often crowded with hundreds of eager tourists. During the green season, no such problem exists, affording the perfect opportunity for an Angkor Wat temple tour. A common misconception about the rainy season is that it pours all day. The reality is that it rains for a few hours at a time, with the sun then peeking out from behind the clouds, air temperatures stay lower than peak season. While that may not align entirely with your expectation of vacation, we urge you to give it a chance. The rain promotes flora growth and results in a stunningly lush, green countryside. Photography options are bountiful, with this being the best season to soak in the beautiful paddy fields, lotus farms, and the stunning Tonle Sap Lake. Fauna lovers also have a chance to watch the indigenous toucans in their vibrant green habitats on our own brother island, Koh Bong. Nature lovers can rejoice in the Cambodia rainy season’s wide variety of forests and jungle, all brimming with life. The perfect destination to capture the country’s natural beauty is a visit to the Phnom Kulen National Park, considered by Khmers to be the most sacred mountain in all of Cambodia. 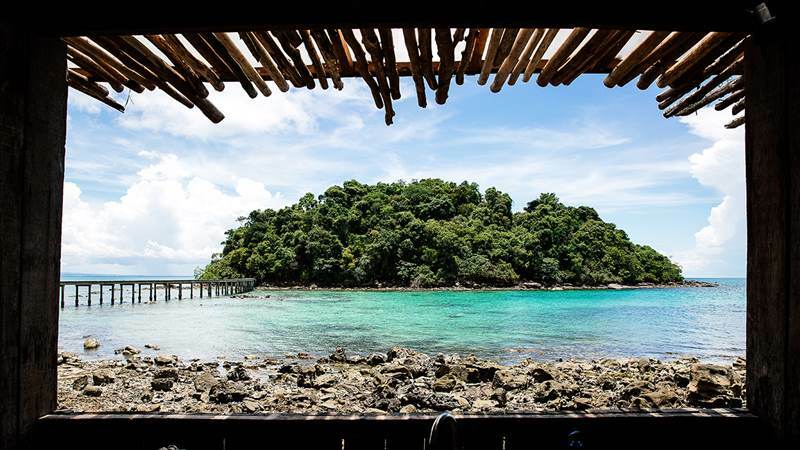 The Koh Rong Archipelago is also not to be missed during this period. The islands are not only mostly vacant, but this time of the year provides the best sunrises and sunsets - perfect for a romantic getaway. If you find yourself looking for a unique experience, Cambodia during the green season is unforgettable. Should you strive for the perfect blend of culture and nature, spend time in Siem Reap to soak in the culture, before taking a 40-minute flight across to the pristine Koh Rong Archipelago to bask in all of nature’s glory. Between the huge savings, stunning views, and ample personal space, there should be no reason not to strike it off your travel list. Should the urge overcome you, be sure to visit SongSaa Private Island in the Koh Rong Archipelago, with our private white sand beach, unique overwater villas and nature reserve, it’s an adventure not to be missed.